A team of researchers at the Nanoscience Center of the University of Jyväskylä in Finland have successfully produced rings and short chains of gold nanoparticles with unparalleled precision. Special kinds of nanoparticles with a well-defined structure were used. They were linked together with molecular bridges. These structures - especially large molecules - enable highly accurate studies of light-matter interaction in plasmonics and metallic nanostructures. Several tools are offered by nanotechnology to fabricate nanoparticles with cores containing just a few hundred metal atoms. At this scale, new appealing properties materialize. For instance, the light-matter interaction is very strong and catalytic activity progresses. These properties have resulted in numerous applications, such as, catalysts and chemical sensors. Synthesis of nanoparticles usually yields a variety of sizes and shapes. The approach we use is exceptional in the sense that after purification we get only a single type of a nanoparticle. These nanoparticles have a specified number of each atom and the atoms are organised as a well-defined structure. It's essentially a single huge molecule with a core of gold. 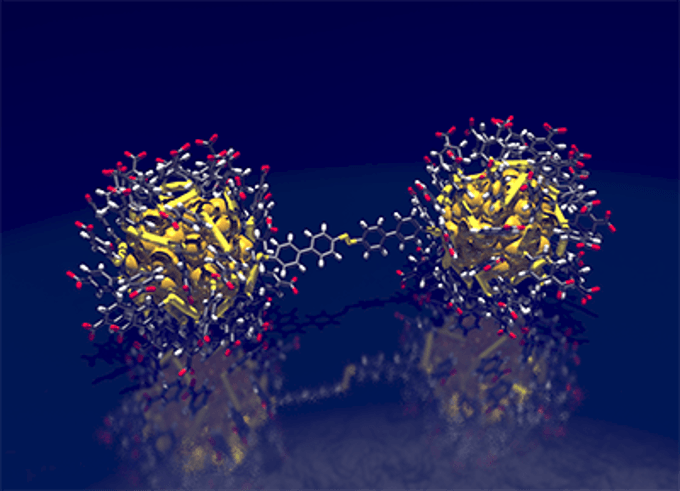 The nanoparticles were coupled with molecular bridges forming pairs, rings, and chains of nanoparticles. “When these kinds of nanostructures interact with light, electron clouds of the neighbouring metal cores become coupled,” explains researcher, Dr Eero Hulkko. The coupling drastically modifies the electric field that the molecules between the particles experience. Studying nanostructures that are well-defined at the atomic level allows us to combine experimental and computational methods in a seemless way. We're aiming to understand light-matter interaction in linked metallic nanostructures at the quantum level. Deeper understanding is essential for development of novel plasmonic applications. The study builds on a long-term multidisciplinary partnership at the Nanoscience Center of the University of Jyväskylä. “I'm very happy that our dedicated efforts on studying monolayer protected clusters and their applications have created a unique multidisciplinary centre of excellence that is able to continuously publish high-impact science,” says Academy Professor Hannu Häkkinen, head of the Nanoscience Center. The Academy of Finland funded the research. In addition to the above persons, Karolina Sokołowska, Dr Tiia-Riikka Tero, Ville Saarnio, Dr Johan Lindgren and Professor Mika Pettersson contributed to the research. The research was published in the Nanoscale journal on 21 September 2016. CSC – IT Center for Science supplied computational resources.